Every year the demand for eco friendly merchandise continues to grow. As the need to preserve the environment grows and public concern becomes more widespread more and more business planning takes environmental impact into account. While many of the classes of eco-friendly products have questionable credentials, so far in the early weeks of 2019 jute produce bags are proving to be the real deal. Both made of naturally produced compostable jute fibre and having the functional advantage of saving produce from untimely disposal the expanding range of branded jute drawstring bags is proving to be an ideal way to get your logo noticed while reducing waste. These days many companies understand reputation on the market is partly dependent on their green credentials and because these perceptions are increasingly important skepticism amongst consumers as to whether these claims are genuine is also on the increase. The simple act of offering a product which has an irrefutable eco friendly heritage, like jute produce bags, is a sure fire way to win consumers over to your brand next time they are shopping for groceries and fresh produce. Without looking too hard it seems a natural fit for custom jute produce bags is the fresh fruit and vegetable market, both at a retail and wholesale level. It makes a lot of sense for a grocery shop to hand these out to clients. Not only will it encourage people to buy more and remember their brand but of course when the produce is delivered to the table in premium condition the likelihood of consumers returning to purchase more is increased. But the opportunities are much greater as everyone buys fresh produce regularly and the natural connection between what is perceived as a healthy lifestyle choice and a greater concern for the environment. Jute is a natural fibre which was popular prior to the second world war. In recent decades it’s been overshadowed by the ever increasing range of synthetic fibres but as people become more concerned about environmental issues jute has seen a resurgence. Jute is a natural fibre which comes from cultivation of corchorus capsularis, a long fibrous plant native to China, but now grown in many tropical and subtropical locations. Once you’ve finished with jute, unlike most artificial materials, it can be composted, so every stage of its production use and disposal is environmentally sustainable. People are more concerned about the environment than ever and to some extent the obsession with healthy eating is part of the same change in focus. As people look for more natural options in both the products and the foods they consume it’s considered to be broadly true that the greater the level of processing and artificial ingredients in a foodstuff the less healthy it will be for those who eat it. Similarly, environmental concerns are largely driven by a focus on a similar desire for the whole planet. The recent trend towards jute bags has seen a range of different sizes and styles available. The drawstring jute bag version is custom branded product option most popular because it is both practical and a simple style to handle and the flexibility of size and simplicity of closure makes it an all-round effective accessory. Once the fresh produce is placed inside the drawstring immediately closes the bags and keeps the contents safe. And of course there are uses for a drawstring bag beyond the kitchen. As a gift bag or a hand carry-all they can be used to store just about anything. The other great advantage of branding an distributing jute produce bags is that people tend to take them with them on their shopping expeditions ensuring your logo and message get more widely noticed. 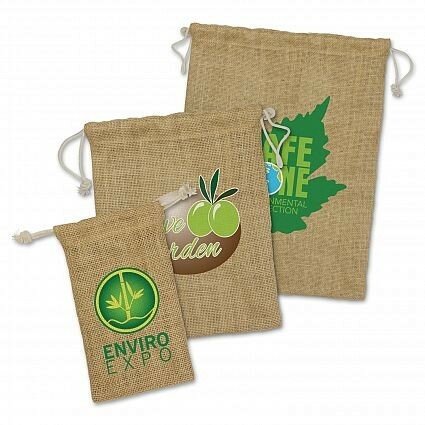 If your company is looking to enhance its environmental credentials, as many are these days, take note of the utility and versatility of jute drawstring bags to get your message out there. Author Bio - Bill McGrath is the founder and Managing Director of Fresh Promotions, one of Australia’s leading promotions agencies with dozens of the nation's top 100 companies as long-term clients. With many years experience in retail and trade promotions, clients have come to depend on Bill’s advice in sourcing promotional products in Australia which enhances the values of their brand.